Since early morning, there has been a flurry of activity at a small airstrip near Radhanpur Chowk in Mehsana town in north Gujarat. Several small aircraft can be seen landing at the airstrip from the window of a hotel room located at the chowk. It's the last day of the election campaign in Gujarat and a hotel attendant isn't surprised to see these many aircraft landing. “Today is the last day of campaigning and several influential people are coming to Mehsana to campaign for Nitinbhai Patel [the BJP candidate], who in all probability is staring at a defeat. I have heard that several influential Patidars settled in foreign countries have been roped in by the deputy chief minister to convince Patidars to vote in his favour,” says Rajeshbhai Vyas. When asked whether these NRI and influential Patidars can tilt the election in favour of the BJP heavyweight, Rajeshbhai says that nothing can make Patidars change their decision. “They have pledged to defeat Nitinbhai. Patidars, particular those in the age bracket of 18-35 years, are expected to turn up in large numbers to vote against BJP. This does not bode well for Nitinbhai,” he says. Considered to be one of the strongest BJP leaders in Gujarat, Nitinbhai, who is also Deputy Chief Minister, is facing a tough challenge from Congress' Jivabhai Patel. Widely considered to be the epicentre of Patidar agitation, led by Patidar Anamat Andolan Samiti (PAAS) chief Hardik Patel, Mehsana is witnessing a high-pitched battle between BJP and Congress with many predicting a victory for Jivabhai. In 2004, Jivabhai had won the Lok Sabha elections from Mehsana and is quite popular among Patels and even Thakors. In fact, he defeated Nitinbhai in the 2004 election and this is the first time that the two heavyweights would lock horns together in an assembly election. Traditionally a BJP bastion, Mehsana is also known for electing one of the party's two MPs in 1984 when AK Patel defeated Congress' candidate. But all of that seems to have changed with Hardik issuing a clarion call to Patidars to defeat the BJP. Locals feel this has completely changed the equation and BJP is all set to lose. At the Radhanpur chowk, which is crowded by food stalls and tea shops, Vijaibhai Patel is busy issuing instructions to his staff to fry the samosas before the crowd begins to trickle in. He has a total of seven employees who hail from the neighbouring Banaskantha district in north Gujarat. 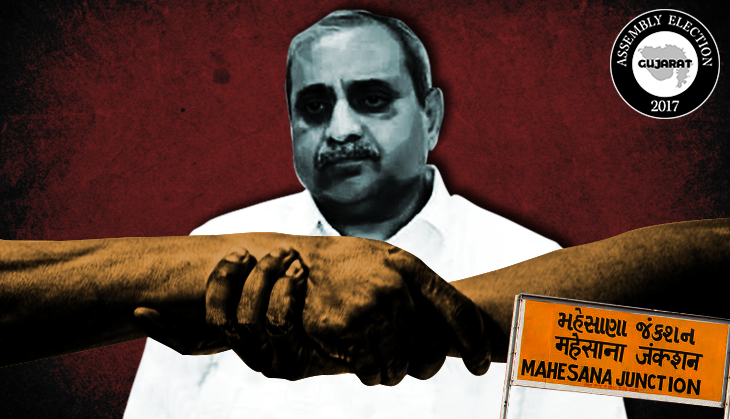 All those employed by Patel are Thakors, who constitute nearly 20% of the population in Mehsana assembly constituency. When asked about who is favourite to win Mehsana, Vijaibhai gets a little agitated and questions back: “Don't you read newspapers?” He adds that Patidars have decided to make Nitinbhai pay for betraying them. “He should have resigned when Patels were being fired upon by his government. How dare he ask us for votes? Can he go to the families of the boys who died and ask for votes?” he asks. When asked to explain, Vijaibhai shares his own example and points that he has seven workers and all of them would vote for the candidate of his choice. “Similarly, several other Patels have employed people from other communities who vote according to the wish of their masters. It is for this reason that BJP has been winning. In the past, Thakors would have wanted to vote for Congress but we told them not to,” he says. At the other corner of Mehsana, Vimalbhai Jagdishchandra Vaidya agrees to what Vijaibhai has to say and adds, “These elections are unique because for the first time in the last few decades, Patidars and Thakors are voting for the same candidate/party. Earlier, the Patidars did not let their workers vote for BJP which helped the saffron party win but tables have been turned now. Due to Patidar agitation, BJP is on the back foot and even Nitinbhai knows this,” he says. Vimalbhai then informs that the constituency with a total of nearly 2,57,000 voters is dominated by Patidars (65,000) followed by Thakors (44,000), Dalits (42,000), Muslims (16,000), Kshatriyas (10,000), and others. “If Patels and Thakors vote for Jivabhai, its vote share should jump multifold as these votes would add to Congress' KHAM vote bank.” In these circumstances, he claims that there is no way BJP can win Mehsana. “I am of the opinion that only 20% votes from Patidars and Thakors will vote for BJP but that is not enough,” he points. Further, he claims that Alpesh Thakor's popularity in the region would certainly benefit the grand old party. Thakor started his campaign against prohibition from Mehsana and even Patidars and other communities supported his cause and now people see him as Hardik's friend which should translate into votes for the Congress. “It is a social evil and Thakor's campaign struck a chord with all communities. He is very popular among the people here,” he adds. Moreover, he says, that Dalit leader Jignesh Mevani, also has a huge following amongst Dalits and intelligentsia in Mehsana and they are most likely to vote in favour of Jivabhai. “Even Prime Minister Narendra Modi and Amit Shah mention his name in their speeches which tells you about his stature. He is in for a long innings in politics. How can any candidate win if he doesn't have support of these caste groups,” says Vimalbhai. Meanwhile, BJP workers express hopelessness in how Patidars are not even allowing them to campaign in many parts of the constituency. “Some of our workers have been abused, threatened and even beaten for campaigning in Patidar dominated areas. Similarly, Mevani's followers do not let us in Dalit dominated areas which has hurt our campaign,” says a BJP worker in Mehsana. In contrast, a Patidar government employee, who did not want to be named, takes pride in not allowing BJP leaders in their area. “We have told them that if they come here we would not care whether they are Patel or someone else. If they still do, we will teach them a lesson and beat them if necessary,” he adds. The buzz in Mehsana is that the campaign in Mehsana could easily be the most expensive one in the state and that close to “Rs 100 crore” has been earmarked for it. In fact, political observers and locals are convinced that it is the deputy CM who has propped many Independents to contest elections. Mehasana has a total of 34 candidates in the fray – the highest in the state. Meanwhile, all the people that this correspondent spoke to spoke about how Nitinbhai has brought development to the region and how farmers have benefitted the most. “He spent nearly Rs 2,000 crore in his constituency and built hospitals, roads and schools. He has even ensured that water reaches every village. So people appreciate that and might not be misguided by the likes of Hardik or Thakor,” says BJP's city president Kaushikbhai. Playing down the Patidar agitation, he says that those above the age of 50 are certainly voting for BJP and that no one, including Nitinbhai, is worried about his victory. “These youngsters haven't seen Congress rule that is why they want to vote for them. Vikas might not work in other areas of Gujarat, it will certainly help Nitinbhai,” he adds. According to him, Dalits, Muslims, Thakors, Baniya, Brahmin, Kshatirya, among other castes are voting for the BJP and that there is nothing to be worried about. “Congress' organisational strength is non-existent while we have our workers spread out across the constituency,” he claims. When questioned about Patidars not letting BJP campaign in their areas, Kaushikbhai adds that this problem is prominent in Becharaji constituency. Contradicting his claims, Vijaibhai says that Patels of all age have joined hands with Congress and the elderly supporting BJP is baseless. “I agree that the youth has taken over the political space and the elderly have been completely sidelined on matters of politics. Youth of today does not want jumlas, they want jobs and that is what this government has not been able to provide. And, when they ask questions, they are fired upon. So why should they vote for BJP?” Vijaibhai asks. In fact, Mehsana district has seven assembly seats with BJP and Congress winning five and two respectively. The situation is not very different in other assembly constituencies where BJP is facing stiff competition from Congress particularly because of three factors – Hardik, Jignesh and Aplesh. Just like Mehsana, each of these constituencies have an overwhelming population of Patidars, Thakors, Dalits, Muslims and Kshatriyas, who could easily swing the result in favour of any party. And this time around, it seems they have chosen Congress which could very well spell doom for the saffron brigade in the region. As far as Nitinbhai is concerned, it does seem that he is fighting a losing battle. As for Mehsana, it sits on top of a volcano. Why? If BJP wins Mehsana, the possibility of Patidars violently raising the issue of EVM rigging is not being ruled out. “If BJP wins, Mehsana would erupt again, be it over the issue of reservation or EVM fixing,” warns Vijaibhai.